We have our own Student Parliament made of up of elected reps, a Student Leadership Group as well as elected Head Boy and Head Girl and SALTs (Student Academy Leadership Team). We also have a range of other student voice groups, including Phase Forums and the 3 Voices – linked to key Academy improvement areas and priorities. Students are taught in a variety of ways including Home Group time, assemblies and in subject specific content about the importance of democracy. We place a great emphasis on promoting diversity with the student and staff body. Our RE, assemblies and Home Group teaching reinforce this. Members of different faiths or religions are encouraged to share their knowledge to enhance learning within classes. 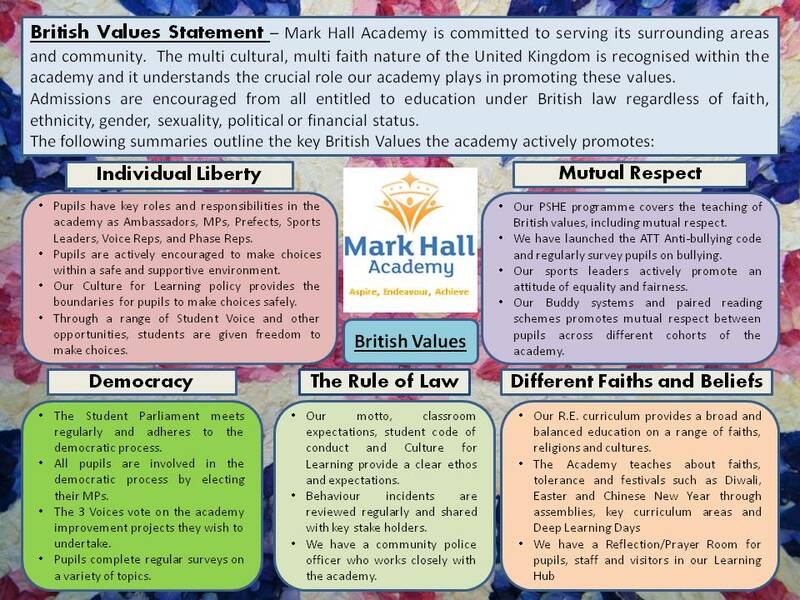 We expect all members of our academy to show tolerance of different faiths and beliefs. This policy is currently under consultation and will go the Governing Body in the Autumn term 2015.